Teaching children about eating healthfully and exercising should begin at an early age. According to the Centers for Disease Control and Prevention (2012), 17 percent of American children are obese, and this number is rising. Whether your child is overweight or not, healthful eating and exercise are keys to personal well-being. As a parent, you can take an active role and guide your child in the right direction to grow and pursue good health for a lifetime. Discuss with each family member the importance of eating nutritious meals and beverages throughout the day. • During snack times, offer healthy and fun snacks. Spread peanut butter on whole-grain bread, or cut up different fruits and vegetables. • Try starting a traditional or container garden with your child to promote vegetable eating. • Consider your beverage choices. Serve low-fat or fat-free milk with meals, and have water (instead of sweetened beverages) to quench thirst throughout the day. Most parents believe their children are always active. However, research has found that children today spend very little time exercising vigorously. Children who are overweight generally are the least likely to participate in vigorous activity. Try asking your children what activity they would like to do, and then do it together. Go to a park pool or the backyard. Ride bikes together, go for a walk or play an active game. If the weather keeps you indoors, try dancing to music, acting out a book or playing Simon Says. As a parent, set a good example for your children. 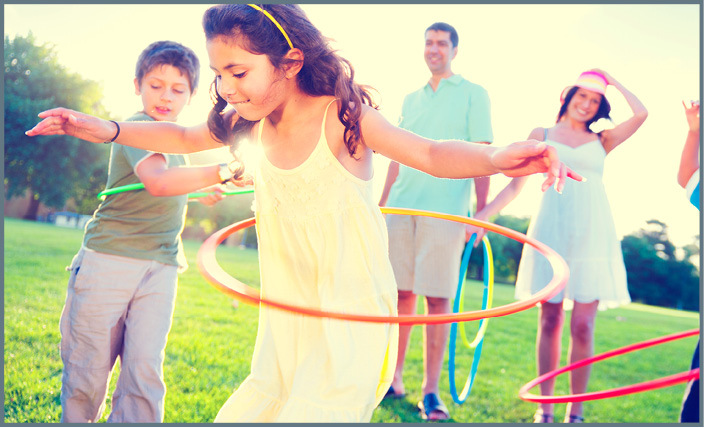 Parents need to accumulate at least 30 minutes of moderate activity on most days of the week. Work together as a family on gardening, picking up litter or cleaning, walking, exercising or biking. Spending time doing physical activities with your children is a great way to spend parent-child time, get fit and set a positive example of healthful living. Question: My two boys are always watching television, and I am concerned they aren’t being active enough. What can I do to get them away from the TV? Research has shown a link between how much TV a child watches and weight gain. The more television time children get, the more likely they are to become overweight. This news is alarming for many parents because they often find their children in front of the screen, whether the TV or the computer. Try limiting your children’s television time to about one to two hours a day. They may be upset at first, but they will learn to enjoy it. Help them find new things to do instead, such as playing board games, riding bikes or doing art projects. Keep TVs out of bedrooms, and avoid eating dinner in front of the TV. You also can encourage TV time to be “activity time” with interactive video games that promote action such as tennis or other sports and dancing. Finally, remember to follow your rules by limiting your television time. Get outside with your children and walk, ride bikes, play catch, engage in hide-and-seek or enjoy other physical activities. Children are much more likely to leave TV behind and get active when adult family members engage with them in such efforts. Cook chicken breasts in olive oil until cooked through. Transfer chicken to a large pot with remaining ingredients. Add sour cream last to keep soup from curdling (do not bring to a boil). Cook on medium heat, stirring occasionally, until all ingredients are blended together and the soup is heated through. Each serving has 170 calories, 3.5 grams (g) fat, 13 g protein, 22 g carbohydrate, 5 g fiber and 135 milligrams of sodium. Quick Tip: Cleaning is great exercise. See who can pick up his or her room the quickest.